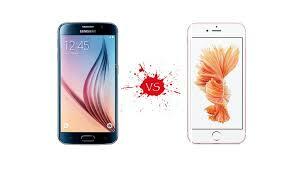 This battle is one of the most interesting there is; the latest flagships phones in head to head combat. With the release of the iPhone 7 just recently, the Galaxy 7 has gotten a solid competitor. Wondering if it’s time to upgrade your phone? Or you’re in a dilemma on which contract to pick between the two? Not to worry, here’s a side by side comparison that will help you get the best deal for you. First things first, the size of the phone is a good determinant of whether you’d love the phone or not and here, the difference is not as great. The Apple is just a bit smaller than the Galaxy 7 with a 4.7-inch sized screen that’s only 3% smaller than the Galaxy that’s at a 5.1-inch screen size. The Galaxy weighs in at 152g while the iPhone is at 138g. A 5.1 inch is a lot better to use if you plan on using VR headsets as compared to the smaller 4.7 inch screen. When it comes to the screen display, the Galaxy 7 takes the lead at 2560 x 1440 with 577 pixels per inch. You’ll therefore, get a better display with more detail as compared to the Apple handset that’s has a resolution of 1334 x 750 display. However, the Apple flagship has a pressure sensitive display where you can bring up various options depending on the pressure you apply on the screen. We’re in an era where the camera quality matters so much more than the processor used. Phones are the main means of taking photos and capturing those precious moments. So how do these two fair? Well, both of these phones use 12MP rear cameras enforced with optical image stabilisation in case you’ve got shaky hands. However, the Galaxy 7 has got a much larger aperture which means it’ll let in more light. This is a feature that’s particularly helpful in low light areas. The iPhone 7 boasts a new and improved chipset as compared to its predecessors. The A10 Fusion is about 40% faster than then the A9 in the iPhone 6. The A10 is a quad-core processor. Galaxy’s Exynos 8890 is an octa-core processor with 4 GB RAM. Theoretically, the Galaxy S7 should be a more powerful smartphone. However, the iPhone is highly optimised and can beat the Galaxy on efficiency. The Galaxy S7 comes with either 32 or 64GB storage capacity while the iPhone 7 exists in 32, 128 and 256GB variants. However, the Apple iPhone doesn’t use a micro SD card which is usually very convenient when you need to increase the storage capacity after filling up your phone with apps, videos, and images. When it comes to the battery life, the Galaxy S7 would probably win the fight. It’s got a 22-hour talk time. However, none of them would get you past lunch on day two of not charging, so you’ll be better off charging them every night. What’s going to be a huge inconvenience to the iPhone users is the lack of a headphone jack on it. It could be a death sentence for the iPhone 7. You’ll have to use the Lighting port for the headphones or the adapter bundled with it.